September: Autumn Garden - Attractive view of a garden in early autumn, with tall grasses and late blossoms framing a winding stream dotted with stepping stones. 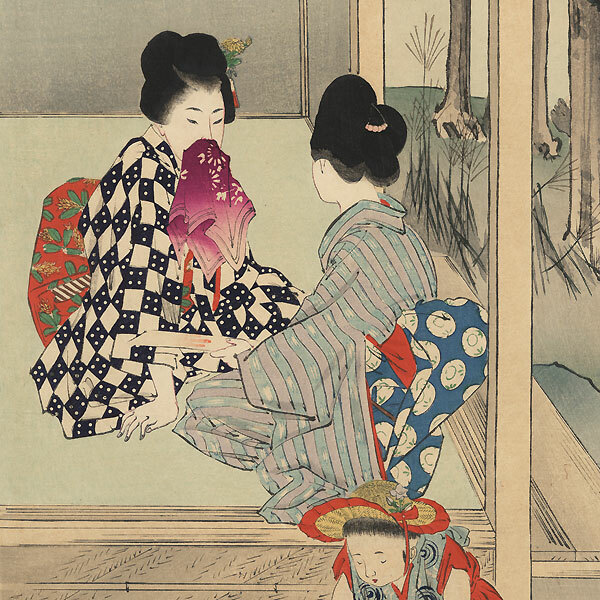 At left, a woman shares a poem slip with a friend, who shyly hides her mouth behind a cloth handkerchief. Just below, a young boy reaches for a butterfly fluttering about as his mother hurries after him. He wears a blue tie-dyed kimono and a straw hat tied under his chin with a red ribbon. In the center, a young girl looks up with a smile, enjoying the fall weather. 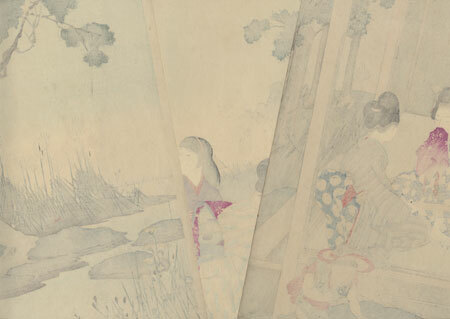 Beautifully detailed with burnishing in the women's hair and fine bokashi shading in the sky and water. A charming subject. Condition - This print with excellent color and detail as shown. Three separate panels. Slight toning, a few creases, diagonal fold at corner. Please see photos for details. Good overall.